BurrobotMedia:Sonic1 MD US SonicJam manual.pdf, known as Mogurin (モグリン) in the Japanese manualMedia:Sonic1 MD JP manual.pdf, is a Badnik found in Labyrinth Zone and Scrap Brain Zone Act 3 in the Sega Mega Drive version of the original Sonic the Hedgehog game, as well as the 8-bit Labyrinth Zone in the 8-bit versions. They are enemies which pop out of the ground when you are near, hitting you if you are close enough. They move along the ground slowly and can climb up onto higher ledges almost instantaneously. Grounder from Sonic the Hedgehog 2 is a similar, if bulkier, version of this enemy. They also prefer to bust out from behind walls rather than jump out of floors. This Badnik returns in Sonic 4's Lost Labyrinth Zone, functioning like it did in the classic games. It also returns in the Wii U/PC version of Sonic Lost World where they are found in the wide-spaced sections of Frozen Factory Zone 1, waiting for Sonic to approach. When they pop out of the ground to attack the player, they often end up getting stuck in the ground with their drill nose. They also appear in the underground section of Silent Forest Zone 4 where they will chase the player while they are using the Yellow Drill, possibly getting stuck on stone circles should they collide with them. The player can defeat it by ramming into its non-drill spots with the Yellow Drill. Burrobot in Sonic the Hedgehog (16-bit). Burrobot in Sonic the Hedgehog (8-bit). 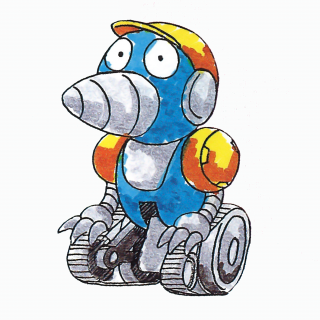 Burrobot in Sonic the Hedgehog 4. This page was last edited on 28 September 2018, at 15:28.